I have a rather lovely Liz Earle Young Skin Try-Me-Kit here that I’m dying to break into myself but know that at 28 years old my skin doesn’t really qualify as “young” anymore. I hope you can hear me sobbing at the back! If you’re interested please leave your name below and remember to put your email address in the bit where it asks for it so I can contact you! I’d ideally like you to give it a full 3/4 week test period before letting us know your thoughts on the kit…. so if you can commit to a new skincare routine for that period and are happy to share your thoughts with my readers then let me know in the comments below! I’ll chose a reviewer on Wednesday 5th. *UK only, sorry chaps I gotta think of the postage! I would love to try this! I was thinking of buying some but wasn’t sure so this would be perfect! All my cleaners and stuff have all ran out at the same time so im in desperate need of some more. Im 24 years old. I’d love to try, am 23 and spots are the bane of my life, currently trying all sorts of pills etc to sort it out. Would be cool to give this a go! Ooh I’ve been looking for some new things and would love to try this! I have spots. They are a pain. I’m willing to try anythign to get rid of them! I actually have more trouble with spots now than I did when I was 17 – no fair! Hi, I’m Sarah, I’m 21 and my skin is the bane of my life – alternating between oily and dry with more breakouts than an American prison drama! I’d love to try this out,have always been curious about Liz Earle. I have quite difficult skin, so if this works for me it’ll work for most people! Hey I am 23 and would love to try and review the products for you. Hey Charlotte, I’ld love to try this, I’m willing to try anything to sort my skin out, it’s rebelling against me at the mo! I’m 21. I think its nice that you’re able to give us this opportunity to get involved. I’m 23 and I’d definitely like to be considered for trying out the kit. I have combination skin and I’ve heard that the muslin cloths really help battle the dreaded dry patches so I’d be interested to see how well that works. I’d love to review this and share my opinion on it. You have lots of willing volunteers! I am one more… I’m turning 20 in August, and I’m in the UK. I’d like to review this for you! ….Oh wait you said 25! *looks in mirror* Err, I’m a tiny bit over the age requirement but my reflection assures me I can still pass for 21, does that count!? I would love to try out a new skin care routine! I am 22, and live in the UK, just had a baby so my skin is still trying to work itself out! maybe a new routine might change this? I’d love to review this skincare range. I’ve just turned 24 and have been battling horrible skin since I was about 11! My skin has weirdly gotten less oily since moving to the UK (I’m originally from NZ) but I still seem to have constant breakouts. I still get an oily t-zone and have weird dry patches on my cheeks. So frustrating! As much as I love my Lush skincare I think it’s time to try something else. I’ve also been eyeing up the Liz Earle range since moving here as you can’t get it back home. Hi! I would love love love to try this out! Been meaning to get a sample of it for some time after reading so many rave reviews about it being such a cult product. I’ve had really bad skin recently and so basically i’m willing to give anything a go. Ahhh I’d love to do this! Just turned 17 and am a religious reader of your blog – I already have the Liz Earle Cleanse and Polish which I lurrrrrrrrrve so would love to try out a range for younger skin! I’d like to be considered to test Liz Earle! I’m going to be 21 next wednesday and i have weird/combination skin LOL so i’d like to try something new! I’m 21 and I’ve never spent more than a fiver on one item of skincare so I’d be really interested to see if there’s much of a difference using more expensive products. I’ve got KP on my face as well and I’d like to see a reduction in redness. I’ve also got quite sensitive, blackhead-prone skin. I’m basically a wreck! I’m 25 and although soon I won’t be considered young anymore, I would love to give it a try and maybe this will make me stick to a skin care routine finally. I’d love to try it too, I’m 23 and really interested in Liz Earle products, which unfortunately are unavailable where I live (which is Poland). Oily and sensitive skin and still trying to fight those pesky blemishes. Ugh! Would love to try this out, I’m another cheap-y cosmetics girl myself and wouldn’t have a problem trying something new. I’m 18 and my skin’s a combination of dry and “normal” and can be quite spot prone. What a great opportunity! I’ve only very recently discovered your blog and I would really like to try these products and review, for you and others. Trying to find a suitable range for my combination skin is exhausting and at 21, I would love to settle into a skincare routine that will make my skin happy and last me a good few years. Hi, Im 19 and would love 2 try this out. My skin’s been awful since starting work at mcdonalds and im looking for something to clear it up. You couldn’t have posted this last week, could you? Hi, I’d love to try this for you – I’ve used LE cleanse and polish before, but never any of the other products. I turned 20 two days ago! I’ve got normal to dry skin, with the occasion nasty spot! I would love a chance to do a review on your website, I do a lot of reviews for other products (movies, books) and it would be great to get a chance to move into a different direction. I mean, there are only so many romcoms you can watch without starting to write the same cliche style comments! Oo ME, ME, pick me! Whilst I’m still young enough to be considered. Plus I’ve had a crap weekend so I need something to cheer me up! I’d love to be a guest reviewer! I am 22 and since coming back from holiday I need to update my skincare routine anyway, I’d love to try this! =) Thanks. Hi, I would love to be considered for this. 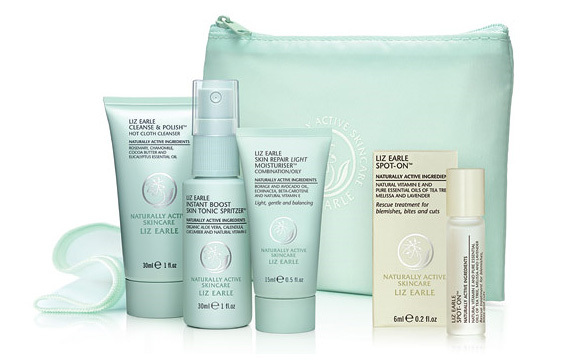 Liz Earle is something I have read about but never tried. I’m completely over hauling all my products at the moment, make up, skin care, brushes…EVERYTHING. So would love to do this and hopefully we can all get something out of it!